The following announcement appears on the NRD website explaining the strong odours the rotting herring spawn produces in the French Creek area. The accompanying map shows the proximity to the treatment plant, which may cause people to question the source of the odour. Every spring, thousands of Pacific herring (Clupea pallasii) return to Vancouver Island to spawn. The Vancouver Island shore between Northwest Bay and the Little Qualicum River is currently in one of the most productive herring spawning areas of the BC coast. In the French Creek area of the Regional District of Nanaimo, seemingly endless numbers of herring deposit their eggs. 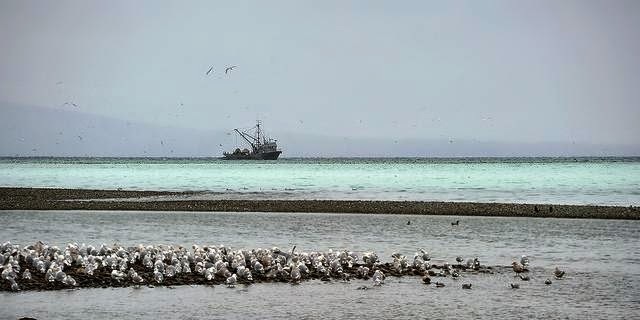 This annual event turns the water turquoise blue and becomes a feeding frenzy for thousands of marine birds and mammals. This coastline received a significant deposit of herring spawn in March. Some of this spawn has washed up above the high tide mark and is naturally decomposing. As the eggs rot, they produce hydrogen sulfide and give off a foul odour that can be detected for kilometres, depending on wind direction. The strength of the odour depends on how many eggs wash up on the beach, which depends on the timing of high tides and storm events. Spawning peaks in March, while the odours can linger until June. 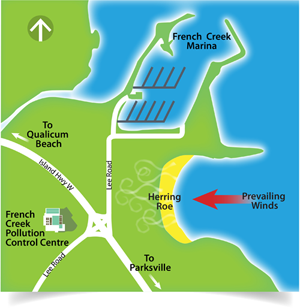 The wind direction in this area is often onshore, which carries the odour towards the Island Highway and French Creek Pollution Control Centre.